Season short ribs with salt and pepper. In a large skillet over medium-high heat, sear the short ribs in the olive oil on all sides until brown. Transfer to the slow cooker. In the same skillet over medium heat, add the bacon, onion, garlic, and shallots. Cook while stirring occasionally until the bacon begins to brown, about 5 minutes. Pour in the red wine and port and cook until reduced by half, about 5 more minutes. Transfer mixture to the slow cooker. Add the broth, thyme, and bay leaf to the slow cooker and cook on high for 5 - 6 hours or until the meat is falling off the bone. Discard the bay leaf and strain the cooking liquid for homemade gravy to pour over top before serving. Season with salt and pepper and garnish with fresh thyme, if desired. I like braised ribs! 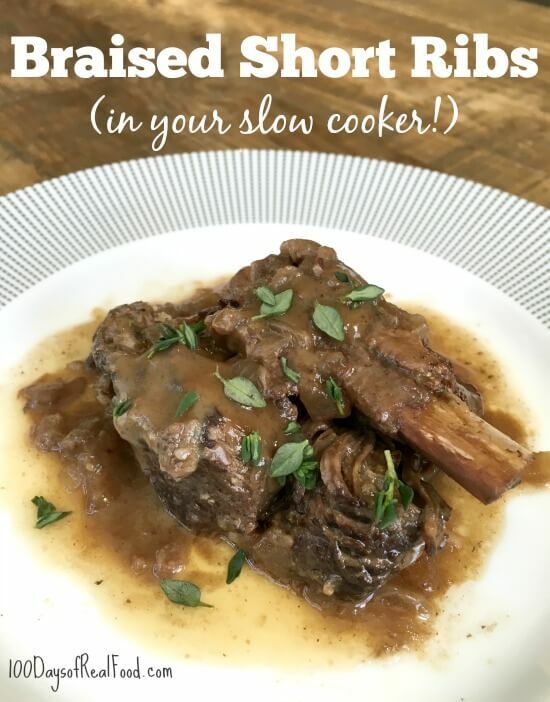 I never try to use slow cooker to cook ribs! It looks easy to cook. 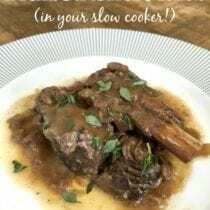 Cant wait to try it tonight by using slow cooker. Any suggestions for a wine substitute, thank you. Try pomegranate infused balsamic vinegar. Or just regular balsamic vinegar. 100% red Grape juice will work too. Or a mixture of any vinegar and beef broth. There are quite a few alternatives, you just want something acidic like wine. Sorry, I’m not an admin, but I always substitute wine with something else so I thought I’d make suggestions, hope it helps! Do you use nitrate free bacon to count as real food? Hi there. Lisa occasionally uses Applegate Sunday bacon but does avoid processed meats in general. This was very good but next time I’m going to double the meat. It was kind of a lot of work (and a half bottle of wine!) and I felt like we didn’t get that much meat. We had a lot of fat on the cut we used so I will ask the butcher to trim it more next time too. I am allergic to garlic, but love short ribs. Will this recipe be any good if I leave it out? It seems to be the main source for the flavor of the dish? Hello. We’ve not tried this recipe without garlic. The full head does add a lot of flavor but you can omit it.